People in the U.S. say that America is the greatest country in the world. After you wear these American-made boots, you might find yourself saying the same thing. These handcrafted Chippewa Men's 25255 Brown 8 Inch Waterproof USA-Made Boots can take care of your fe ... (see full details) (see specifications) #CHP25255. People in the U.S. say that America is the greatest country in the world. After you wear these American-made boots, you might find yourself saying the same thing. These handcrafted Chippewa Men's 25255 Brown 8 Inch Waterproof USA-Made Boots can take care of your feet, even if you decide to walk across the country. We don't advocate doing that, by the way, but we do advocate wearing these shoes for whatever you might have planned for the day. The 8-inch uppers of these boots are manufactured with rich walnut brown leather that looks as luscious as it feels. The soft leather has been oiled to improve its natural water-repellency and flexibility. This gives you men's boots that flex and bend with your steps, so every step stays effortless. Inside, Chip-A-Tex waterproof booties surround your steps to keep you dry and comfortable when you wear these waterproof boots. The booties completely block moisture, so you stay dry and comfortable. Meanwhile, Dri-Lex 2000 lining surrounds your feet to keep you even drier. The lining is both moisture-absorbent and quick-drying to prevent sweat from becoming a problem. Adjust the fit with the heavy-duty, waxed, Sta-Tied laces. They're set in non-tarnishable antique brass hardware that's just as tough as the rest of the design of these brown boots. The entire design is tough, sure, but it’s also made to feel comfortable. Customizable laces are just the beginning. Soft Texon insoles support your steps with cushioning comfort. The non-woven Texon T-90 material adds softness. Triple-ribbed steel shanks add strength to these 8-inch slip-resistant boots. The shanks keep arches lifted to keep your steps supported. This prevents muscle strain and pain. The midsole layers are made with 5 iron rubber to give your steps shock-resistance. More rubber supports your steps in the Vibram Saturn soles. The shock-resistant soles are held in place with Goodyear leather Welt construction. This means a thin strip of leather is placed between the leather uppers and the Vibram soles of these shock-resistant boots. Then, it’s all stitched together with waxed thread that resists moisture and wear. The durable welt construction creates a firm bond, but you can replace the soles as needed. Take pride in wearing these Chippewa Men's 25255 Brown 8 Inch Waterproof USA-Made Leather Boots because you can. Order your pair from the Working Person's Store today. Yeah the boots are comfortable but not water proof as stated, sorry guys not happy about that, Also made in China not in the USA. I was happy when I got them because of the welt and warm to your feet but with just with a few sprinkles water got filtration from the sides seams not worth the money or the price. 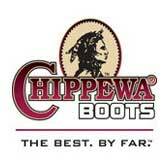 Chippewa Boots: Men's 25255 Waterproof USA-Made 8 Inch Work Boots is being added to your cart.